Our design department at Promotion Plus has the industry experience and technical capabilities to produce high quality designs for any promotional piece. Our industry background allows us to keep quick turnaround times on projects. Since all our services are offered in-house, we are able to meet time sensitive demands because our design department directly interacts with every department here at Promotion Plus to meet the deadline. Once your design is created and approved your project can be expedited through each department until it is completed and ultimately delivered to you. 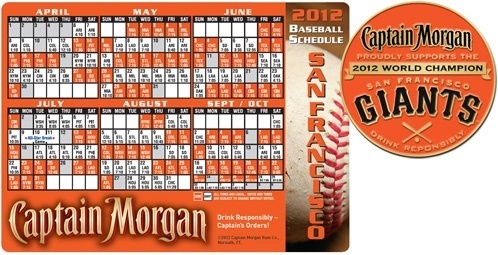 Captain Moran ® relied on Promotion Plus when they wanted to design and print the 2012 San Francisco Major League baseball schedules as magnets. Promotion Plus compiled all the data to be included in the schedule, designed, printed, and shipped custom magnets to all West Coast distributors.